Dandelion greens are eaten throughout the Mediterranean. In Turkey, they’re called “karahindiba” or “radika.” Meltem Birkegren, originally from Istanbul, explained the Turkish way of cooking dandelion greens: “We usually wilt the greens then mix with olive oil, lemon juice, and crushed garlic … You can also wilt the dandelions [and] to the olive oil/lemon juice/garlic … add some yogurt & walnuts.” Inspired by Meltem, and with a bag of cleaned dandelion greens in the refrigerator, I made Turkish Yogurt and Dandelion Green Salad in 15 minutes. 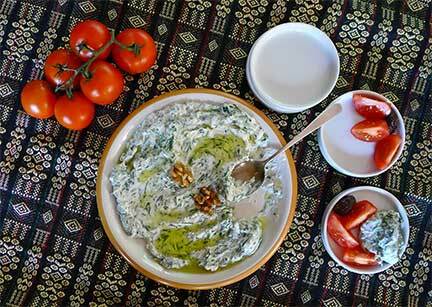 Similar in many ways to Tzatziki, Turkish Yogurt and Dandelion Green Salad makes a creamy accompaniment to grilled meat or chicken. It’s also a tasty lunch (or snack) served with tomatoes and olives or as part of an appetizer spread, with raw vegetables, or with chips, crackers, or bread. It can be eaten right away, but is better after 24 hours in the refrigerator. Spinach may be used instead of dandelion greens. I successfully made this with nonfat yogurt; whole-milk yogurt would also be good. NOTE: 6 packed cups of dandelion greens equals 8 ounces raw and 5 ounces cooked with the water squeezed out. When greens are blanched and squeezed tight into a ball, they measure 1/2 cup. After chopping greens and separating them into pieces, they measure 1 cup. Rhubarb is a vegetable. 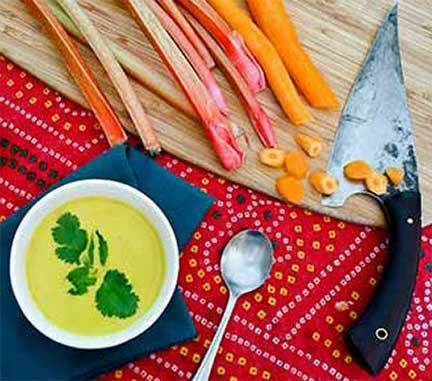 Without sugar, rhubarb is tart, lemony, and a wonderful addition to savory dishes. Lately, I’ve been eating it for breakfast in scrambled eggs. Although unnecessary (and I don’t do it for lunch), when I eat this first thing in the morning, I like adding a teaspoon of honey to the eggs. Even a small amount of honey mellows rhubarb’s assertiveness. In A Fistful of Lentils, the author says eggs and rhubarb go well with toasted bread, apricot preserves, and white cheese (feta works). 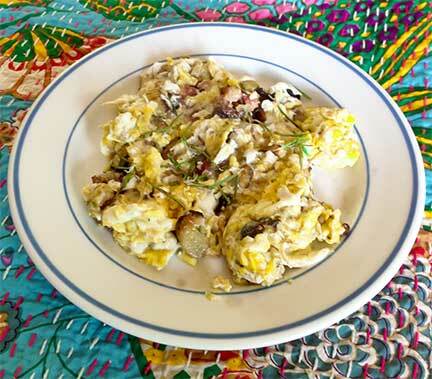 She also likes it as “a savory vegetarian side dish” with rice or roast chicken. To serve a group, multiply the ingredients by the number of servings needed. Crack eggs in bowl, add honey (if using), and whisk to combine yolks and whites. Sauté rhubarb, lightly seasoned with salt and freshly ground black pepper, in 2 tsp. melted butter until lightly browned. When rhubarb is nicely browned on both sides, but before pieces start breaking down, add garlic and cook for one minute. Turn heat down to low and stir in eggs. Cook until eggs are the doneness you prefer (I like mine moist). Put on plate and sprinkle with minced herbs. Serve immediately. Tart and sweet, rich and satisfying; Rhubarb-Crystallized Ginger Sorbet seems like it’s full of dairy. It isn’t. 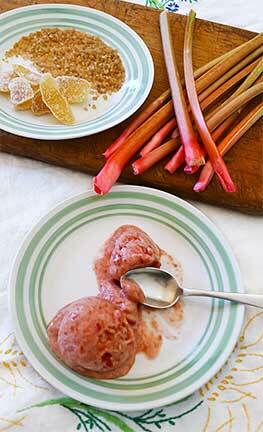 Because rhubarb contains a lot of pectin, sorbet made with it has a creamy texture. Adding a bit of liqueur further improves sorbet’s texture (vodka also works). The ingredients aren’t completely pureed, so you’ll occasionally bite into juicy pieces of rhubarb or ginger. It’s a treat every time. One of our tasters correctly observed that this sorbet makes a great palate cleanser, in addition to being a light, flavorful dessert. Add rhubarb and water to food processor and finely chop. Put chopped rhubarb, its juices, ginger, brown sugar, and salt to saucepan. 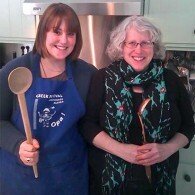 Bring to a boil, turn down heat and cook over medium, stirring regularly, for 10-15 minutes or until rhubarb is tender. Stir in liqueur and cool. When rhubarb is cool, freeze according to manufacturer’s instructions (for ice cream makers using frozen inserts, the rhubarb mix must be cold, not just cool) . When done, put in freezer container and freeze for at least 1 hour before serving. NOTE: Cool cooked rhubarb quickly by putting it in an extra large stainless steel bowl submerged in ice cold water and stirring it periodically until it’s the right temperature. 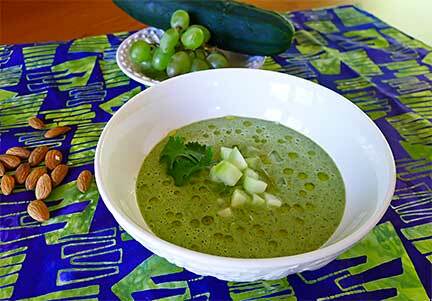 Green Gazpacho is a classic Spanish summer soup. It’s best eaten ice cold and is a refreshing respite on hot days. It’s full of flavor that leaves you happy and ready to belt out Good Day Sunshine no matter how hot it is outside. I made mine with dandelion greens and spruce tips, because that’s what’s in season here. However, Green Gazpacho may be made with any assertive greens, including spinach, parsley, arugula, and mixed fresh herbs. If you don’t like spicy food, leave out the jalapeños or use the lesser amount. If you want a hotter version, leave in jalapeño seeds. 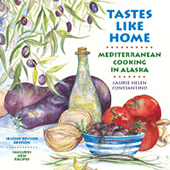 My gazpacho recipe is based a version that chef and cookbook author Didi Emmons recently demonstrated at a class sponsored by Fromagio’s Artisan Cheese in Anchorage. Didi’s recipe is in her book, Wild Flavors: One Chef’s Transformative Year Cooking from Eva’s Farm (Chelsea Green Publishing 2011). Toast nuts in small frying pan over medium high heat, stirring regularly so they don’t burn. When toasted, dump in bowl of blender or food processor. Cut cucumber in half. Use small spoon to scrape out seeds from half of cucumber and cut that half into 1/4” dice to reserve for garnish. Put the remaining half cucumber (and all seeds) in blender/processor with nuts. To nuts and cucumber in blender/processor container, add all remaining ingredients. Turn on blender/processor and whir until ingredients are turned into a coarse soup. Taste and add salt, as needed. If soup isn’t cold, refrigerate before serving. Pour in chilled bowls and garnish with diced cucumber and cilantro. Drizzle with extra virgin olive oil and serve immediately. Note: Only certain blenders and food processors can break down ice cubes. If you have a powerful machine (such as Vitamix, Blendtec, Ninja), use 1 cup water and 1/2 tray of ice cubes. If your machine can’t handle ice, leave it out and use 2 cups water. With this alternative, understanding gazpacho is best served ice cold, refrigerate for at least 1 hour before serving.